Jets Success Powered by the Ponies. - Very Barrie Colts | A website covering the Barrie Colts of the OHL. 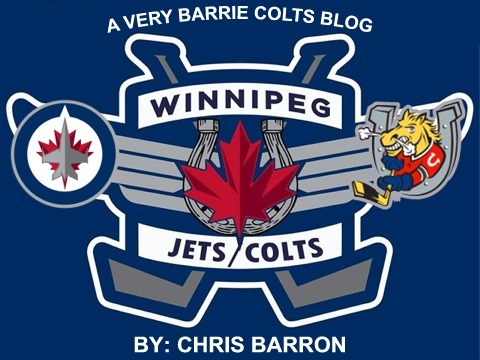 Home Barrie Colts blog Brendan Lemieux Bryan Little Chris Barron Jets Mark Scheifele NHL OHL Winnipeg Jets Jets Success Powered by the Ponies. Jets Success Powered by the Ponies. The Winnipeg Jets early season success (7-3-3, 2nd in the Central) is being fueled by a trio of Barrie Colts alums. Mark Scheifele, Bryan Little and rookie Brendan Lemieux. Here is a quick look at the Barrie Colts playing for the Jets and their AHL affiliate the Manitoba Moose. The reaction to Scheifele’s comments by some in the hockey world was nothing less than ridiculous. Scheifele later clarified his comments, though in my mind he had absolutely nothing to clarify – every player in the league should be aiming to be the best. Scheifele could have just let his play on the ice speak for itself. The former Barrie Colts center is following up last year’s breakout year with another point plus per game season. In 13 games, Scheifele has 7 goals and 8 assists. Just this week, Scheifele notched his second career hat trick – netting three goals against division rival Dallas Stars in a Jets win. Before the start of the regular season, the Jets locked up all time Colts scoring leader Bryan Little to a six-year deal worth roughly $5.3 million a year. Little has been a fixture for the franchise since being drafted by the Atlanta Thrashers. Little, who is the franchise’s active career points leader, has been a steady performer who notched 21 goals and 26 assists in 59 games last year. In 13 games so far this season, Little has a goal and 5 assists while centering the Jets second line. Anyone who follows me on social media knows that I have been a big fan of Colts’ alum Brendan Lemieux. I absolutely love the gritty style of game that Brendan plays. Most Jets fans know Lemieux as an agitator (obviously it runs in the family), but many Jets fans don’t know the offensive skill set the talented young winger posseses – Lemieux netted 41 goals in just 57 games for the Colts in the 2014-2015 season. Lemieux, who was originally drafted by the Buffalo Sabres, was acquired by the Jets in the blockbuster deal that sent disgruntled winger Evander Kane to the Sabres. Lemieux made his NHL debut this year for the Jets and has a goal and a fight in seven games on the Jets fourth line. Lemieux has quickly become a fan favorite – and a favorite of Jets head coach Claude Maurice. It remains to be seen whether Lemieux will be able to stick with the Jets once Adam Lowry and Mathieu Perrault return from injuries. Former Colts netminder Michael Hutchinson has 99 NHL games under his belt including a career best 21-10-5 in 2014-2015. This year, however, Hutchinson found himself the odd man out after the Jets signed free agent goalie Steve Mason. Hutchinson has five starts this year in the AHL for the Jets affiliate the Manitoba Moose. While Jets goalie Connor Hellebuyck never played for the Colts, I would be remiss to not at least mention him – considering he is a Barrie native. The Jets signed free agent Steve Mason to be the number 1 goalie in Winnipeg in offseason, leaving Hellebuyck the backup. Hellebuyck, however, has played his way back into the top goalie slot for the Jets. In his nine starts, Hellebuyck, who is 7-0-2 with a .932 SA, has been flat out spectacular.